After three rounds with barely any decisive games, round four was most probably the turning point of the Norway Chess Tournament. One of the most amazing rounds in the last years, with fighting chess, sacs, strenuous defenses and even a stalemate! Levon Aronian played an incredible game to beat Magnus Carlsen. Sacrificial aggression with a positional foundation was Levon's trademark in today's game. He sacrificed and exchange and then a bishop, to create a piece of chess art. 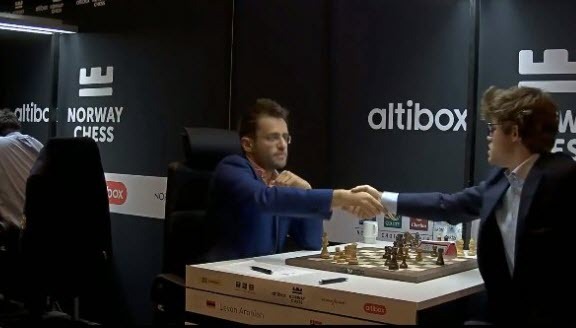 It's the second year in a row that Aronian beats Carlsen at the Altibox tournament. Today could have been a grim day for the World Champions playing in Norway, with Anand losing to Giri and Kramnik in dire straits against Fabiano Caruana, the American with an Italian name. But the great Vlad managed to get off the hook and brought home half a point. Hikaru won a splendid game against the Frenchman with three names. Aggressive play and pure Nakamura-style to jump on top as the sole leader of the tournament, with an excellent 3/4. Incidentally, with today's win Hikaru leap-frogs MVL, switching place with him in the live rating list. Wesley So outplayed Sergey Karjakin, who was completely lost in the endgame. But the Russian found a magic escape, with his suicidal rook chasing the enemy king to force the stalemate!